Acrobat 9 and Creative Suite 5 Are Out! The recently launched Creative Suite 5 is the culmination of twenty-five years of collective product excellence from the development teams at Adobe® and Macromedia®… CS5 is a comprehensive, highly-integrated design environment built of best-of-breed applications. Acrobat 9 and the Creative Suite 5 family have been fully released and are now available for immediate purchase and download. To find out more and get the latest tools, select your desired product for more information. Use Adobe Acrobat 9 to create polished PDF files, present multiple documents in a PDF Portfolio, and even add richly expressive multimedia. And all in a single file. With new native support for Adobe Flash, you can now reliably share video, animations, applications, and widgets across diverse platforms in PDF files. Combine multiple documents into a single, searchable PDF Portfolio, compressed for easy distribution — then brand it with your logo and include descriptions to guide recipients through the contents. Employ new live collaboration capabilities to present and review PDF documents online in real-time. Easily create and manage electronic forms with the dynamic new Form Wizard. Take advantage of improved web capture and optical character recognition (OCR). Enjoy faster product launch times, and deliver perfect results with enhanced print production and preview tools. All this and more in the versatile new Adobe Acrobat 9. JUST OUT: Check out the new “Acrobat TV” – videos with free tips, tricks, training and tutorials! 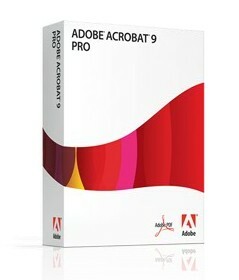 See also the Acrobat 9 Datasheet and the Acrobat 9 Version Comparison, or our recent look at the different CS editions.